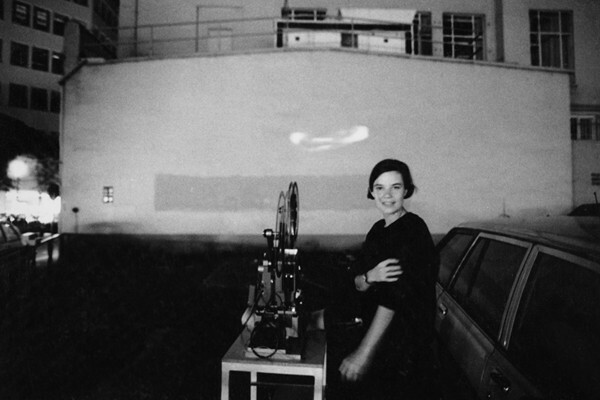 In Hamburg, before open air cinemas became a summer fixture in European cities, the artist experimented by projecting her own film, Elemente, on firewalls, the surface of water, contractor’s sheds, advertising columns or the clothing of passers-by. The planning for the nightly screenings, the technical conditions and the reactions and comments of the viewers were precisely documented. For example, the astonishment of some of the passers-by that they did not have to pay for the screening; the discussions about whether screenings of this nature should be announced or whether one should rely on the power of rumour and the transfer of information from mouth-to-mouth.